Sama Jeries is a 19 year old diabetic with special needs. When she was younger, she was a student at Orient Spirit Developement Centre and evolved to becoming an teacher's helper at the centre. As a student at the centre, she especially loved the cooking classes she took and decided that she wanted to start diabetic friendly foods! Below is the recipe for her delicious diabetic-friendly cupcakes! Mix the oats, baking powder and cinnamon together. In a different bowl, add the brown sugar and eggs to the bananas and beat till completely incorporated and fluffy. This may take a little while. Add the banana, eggs and brown sugar mixture to the oats, baking powder and cinnamon mix. Fold together till completely incorporated. Line a cupcake tray with cupcake lining. Scoop out the batter using an ice-cream scoop and place into the cupcake tray. 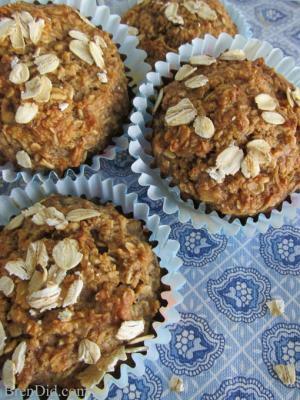 You can add some oats on top for decoration purposes but this is optional. Both peolple with diabetes and without can enjoy these delicious cupcakes!